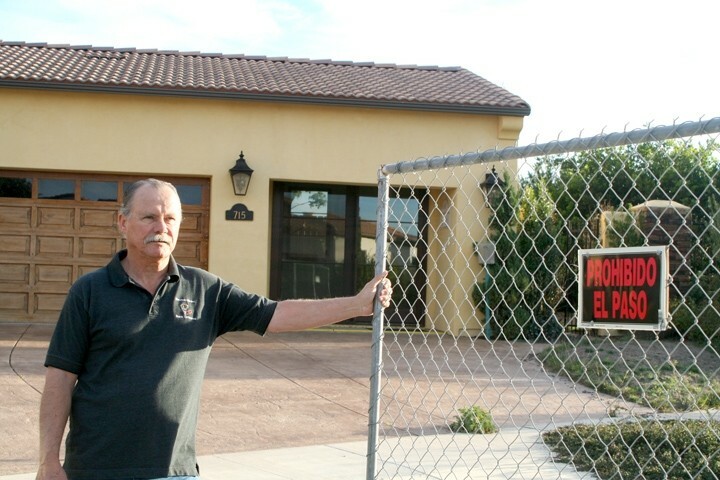 GATED COMMUNITY: Maria Vista Estates resident Aaron Adams bought his $700,000 home in 2007, thinking he’d found a place to retire but he now stands watch for vandals and burglars intent on raiding vacant homes in his neighborhood for appliances. Nipomo’s Aaron Adams thought he’d found his dream home when he moved into Maria Vista Estates, an 84-acre hilltop development complete with dazzling views of the valley’s lush rolling hills. That was in July of 2007. Today, as he walks through his neighborhood of vacant million-dollar homes—the sidewalks cracked and yards overgrown with weeds—he wonders what could have been. It’s like a real-life ghost town or the set of a post-Apocalyptic film: Half-completed, furnished homes stand silent, occupied only by the occasional barn owl or hawk. Gophers have dug holes in the once-pristine landscaping, causing soil to flow out from under foundations into the street. From his own home, Adams is constantly on the lookout for vandals and thieves, who’ve broken windows and made off with microwaves, stoves, dishwashers, lighting fixtures, and in one case, a water heater. The unfinished houses and leftover building materials still stacked on empty lots serve as testaments to a failed partnership of two businessmen: Santa Maria resident Erik Benham and his associate, Mark Pender. After more than a decade of planning, Benham began developing Maria Vista Estates in 1999 as an affordable, but upscale, gated community. The project came about in the midst of the hottest real estate market to hit the area in years, and, according to court documents, Benham and Pender counted on the good times to last. The first phase of the development’s construction was completed in 2006. Benham built three different models of homes, ranging from 2,100 to more than 4,000 square feet. The homes had an average asking price of $825,000. However, before any of them could be sold, Benham and Pender ran into legal problems—the first of many that would plague the partnership. The Nipomo Community Services District refused to turn on the water meters in the finished Phase I homes, citing unmet design requirements. Maria Vista’s builders had installed sewage cleanouts that matched state requirements, but not those of the district. In March of 2007, Benham sued the Nipomo Community Services District in San Luis Obispo County Superior Court to get the water turned on. He lost, and the company was forced to fix the sewer lines. Benham and Pender couldn’t close any home sales until the work was done, and the delay was costly in more ways than one. The company was forced to default on two construction loans, totaling $23.65 million, from L.A.-based Security Pacific Bank. To forestall foreclosure on the development, Maria Vista filed for Chapter 11 bankruptcy, listing about $35 million in debts. 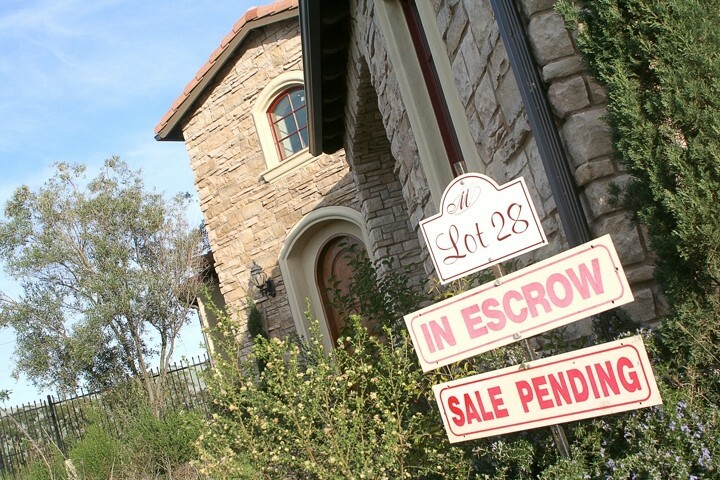 The company hoped to sell the homes and pay back its creditors, but by the time the Nipomo Community Services District finally set up the water meters to the completed homes in July, the damage had been done. To make matters worse, the sub-prime mortgage crisis was already underway and multiple sales at Maria Vista fell through due to buyers being unable to secure loans, according to court documents. GHOST TOWN: Only 24 of Maria Vista’s 77 planned homes were completed and 15 more remain unfinished. Construction on the upscale community stopped in 2007 when developers Erik Benham and Mark Pender filed for Chapter 11 bankruptcy. Only three lots were sold at Maria Vista Estates by September, including the Adams’ lot, and Pender and Benham faced separate civil lawsuits related to the development’s postponement. Work on the project halted with only 25 of the 77 planned homes completed; 15 more were under construction, at about 70 percent complete. In 2008, Security Pacific sued Benham and Pender and a summary judgment was issued against the partnership for the amount of the two loans. Benham also filed for personal bankruptcy, listing Maria Vista among his assets and further muddying the issue. Pender filed a proposal in U.S. Bankruptcy Court for the company’s reorganization in May. Court documents revealed the development had been appraised at more than $44 million, and Pender planned to auction off the remaining properties and have a trustee take over. Two months later, Bankruptcy Court Judge Robin Riblet converted the company’s bankruptcy to Chapter 7. The so-called “straight bankruptcy” allowed Maria Vista to continue operating under the direction of a court-appointed trustee, Santa Maria lawyer Jerry Namba. Riblet also ruled the bank could foreclose on Benham and Pender. Namba appealed the judgment, but was denied. The saga took another strange twist in November 2008. Security Pacific Bank failed. The Federal Deposit Insurance Corporation seized all of the bank’s assets, but the question of who owns Maria Vista Estates remains up to the courts to determine. In an e-mail, FDIC spokeswoman LaJuan Williams-Young said Benham is currently the property’s owner, however the FDIC is involved in a lawsuit regarding the matter. Eric Early, a Los Angeles lawyer representing the FDIC, wouldn’t discuss any pending litigation. Benham, who disputes the validity of the lien on Maria Vista, was reached at his Santa Maria office but declined to comment immediately on the development’s history or current status. Pender couldn’t be located for comment. Adams, who paid more than $700,000 for his home, currently has it listed for sale online at $400,000. He said he’s seen a steady stream of contractors and appraisers recently visiting the property and thinks a sale could be in the works. However, he’s through waiting. “It looks like it might happen, but we’ve just heard that so damn many times,” he said. Adams still believes the development was a “great plan” and doesn’t hold any ill will toward Benham or Pender. He said nobody could have foreseen the housing market collapse, though he does have regrets of his own. “Neighbors would have been nice,” he said. “We just kept hanging on, hoping that eventually they would work their way through the litigation and get another developer in here to finish it up.